I follow the international rock climbing scene, and we constantly hear of repetitions of hard routes on El Capitan. On Youtube, it is possible to find many videos of strong climbers from all over the world climbing (sometimes free) routes such as The Nose, Golden Gate, Zodiac, Freerider and Salathé Wall. But if you look for videos of people climbing Half Dome, or articles about ascents on Half Dome, you find almost nothing. At first I thought that it is because most of the routes there are aid climbing routes, and aid climbing is not very fashionable right now. 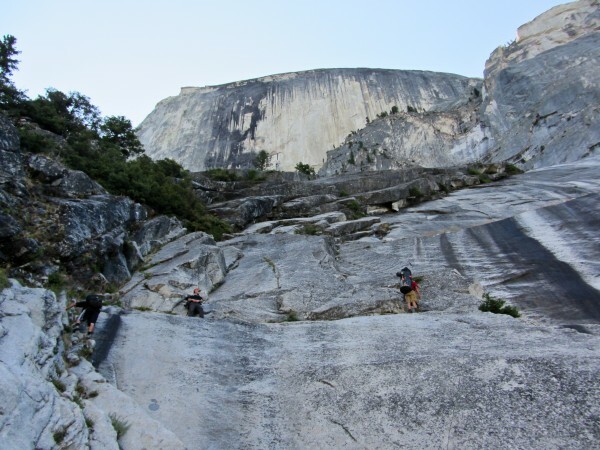 However, most of the routes on El Capitan are also aid routes, and many of them have been free climbed, so this explanation is not very satisfactory. Is it because of the difficulty, i.e. 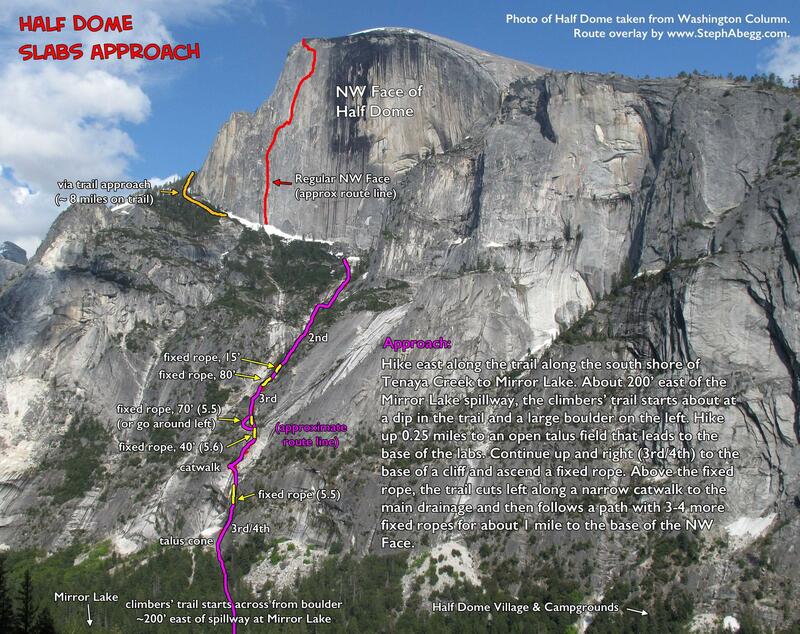 is it much harder to free climb Half Dome (apart from the Regular Northwest Face), or are other factors involved? That rock is just so iconic, and it seems very strange that no strong climber is interested in it. Reading the comments and discussing with other users helped me get a much better idea of the possible causes why we hear of so many hard (sometimes free) ascents on El Capitan and almost none on Half Dome. 1) Hike up from Happy Isles up the Mist Trail through Little Yosemite Valley (approx. 8 miles to the shoulder of Half Dome). 2) Head over from Happy Isles past Mirror Lake and hike up the "Death Slabs". Option 1 is smooth hiking and clearly the way to go for the south facing routes. Option 2 is significantly faster (for the NW face), in both directions, but requires skilled route finding, very steep hiking, and use of fixed lines. Supertopo.com gives an approach time of 3 hours to get to the base of the Regular Northwest Face route (which is on the left side of the NW face, see Fig.1), and even if it is not specified if it is via the trail or via the Death Slabs we can guess is via the Slabs, since it is the fastest path to the NW face. So the approach to HD is not easy: either an 8 miles trail up to the shoulder and then down, or 3 hours up the Death Slabs, a path which includes parts on fixed ropes and some tricky climbing passages (more about the Slabs on summitpost.org). 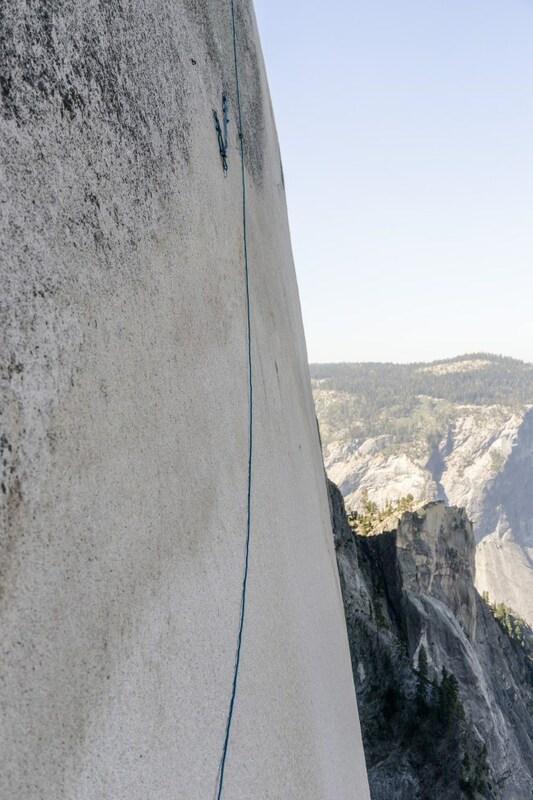 For comparison, the approach to The Nose on El Cap takes just 10 minutes. Working on a hard project requires spending days, weeks, sometimes months on the route. If the route is on El Cap, this is not a problem since it is possible to go by car and simply walk for 10 minutes to the base of the route. This is not the case with HD. Today, aid climbing is not as popular as in the past, and strong climber try to make new free ascents or to free old aid climbing routes. So, when talking about the level, I will concentrate on free ascents. Yosemitebigwall.com provides a list of the most famous routes in Yosemite by length and level. Amongst the routes listed as "beginner" level, only one, the Regular NW Face, is on HD, while El Cap has 5. At "intermediate", we find 25 El Cap routes, but only 3 HD routes. It looks therefore that the average level of the routes on HD is higher than that on El Cap. Take for example the famous route Zodiac, on El Capitan: 5.7 A3, 15 pitches. The Huber brothers, who first freed it in 2015, evaluated the difficulty of the free ascent 5.13+. Since then (at the moment I'm writing is October 2017), the route has seen only other two free ascents as far as I know, by Tommy Caldwell in 2015 and by the team composed by Barbara Zangerl and Jacopo Larcher in 2016.
all of which are longer than Zodiac and as hard, if not harder. Of these three routes, only the Direct NW Face has been free climbed, the first time in 1992 by Todd Skinner and the second time by Tommy Caldwell in 2007. The difficulty of the free ascent is reported to be around 5.13c/d. 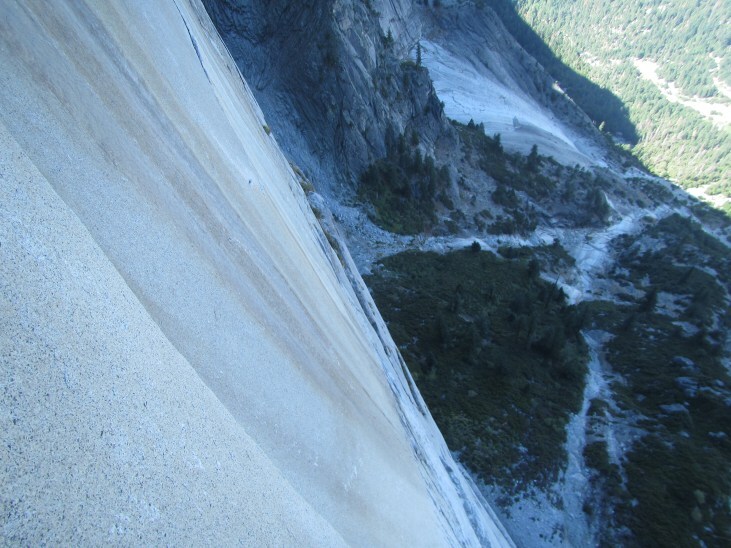 More about big wall free climbing in Yosemite: https://web.stanford.edu/~clint/yos/longhf.htm#half. In 2015, a key section of the famous Regular NW Face route on HD fell off. Water staining on this slab suggests that large portions of the rock sheet that fell were completely separated from the adjacent (and now exposed) rock for decades prior to failure. 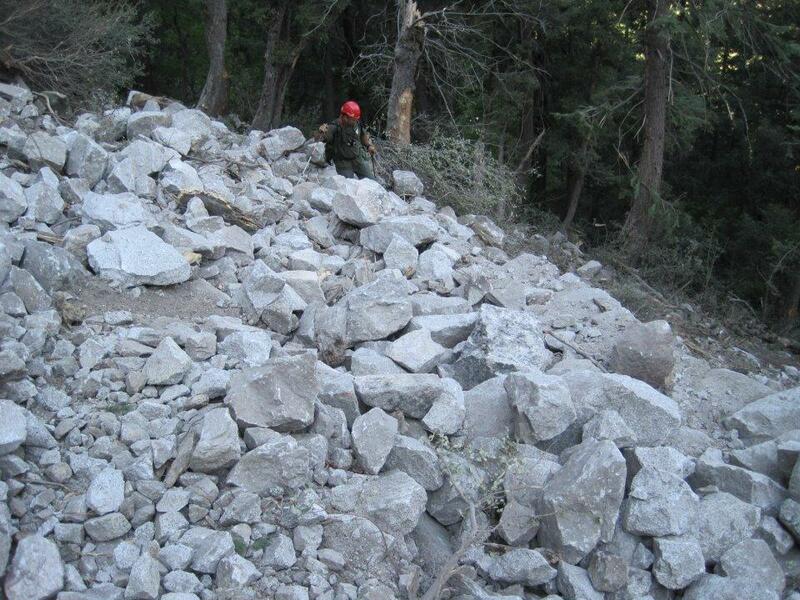 A number of geologic processes set the stage for rockfalls, including glaciation, weathering, and bedrock fractures. Tectonic stresses and erosion cause granite rock to fracture. Rockfalls later occur along these fractures. Fractures that develop parallel to the surface are called sheeting joints. Sheeting joints create large slabs of rock that ultimately fall away in a process known as exfoliation. In Yosemite Valley, Royal Arches and the face of Half Dome are examples of landforms that have resulted from this process. Over long periods, water flowing through fractures decomposes the bedrock in a process called weathering. Weathering loosens bonds that hold rocks in place. These recent rockfalls have left many people wondering wether that section of HD is has not become too dangerous to climb. It may be, therefore, that the peculiar structure of HD makes it more subject to dangerous rockfalls. From the above map (nps.gov) we can see that even if there have been many rockfalls on El Cap, most of the biggest ones are in winter and fall, when the walls are less frequented. The NW face of HD, on the other side, had many big rockfalls in spring and summer, when the frequentation is higher (especially in spring and early summer). Well, this article in National Geographic provides a clue - a number of key areas on the face have become unstable, and a large rockfall has destroyed a section of the Normal Northwest Face. I think there's simply more to climb on El Cap. A quick look at the list of established climbs in Yosemite (http://www.yosemitebigwall.com/routes-by-difficulty) reveals that there are way more routes on El Cap than there are on Half Dome. Interestingly enough, despite the fact the cliff is significantly taller, many of Half Dome's popular routes are quite a few pitches shorter than many of the routes on El Cap, and aren't rated as high. Half Dome is the sheerest cliff on the North American Continent, one of the sheerest in the world. Some of the faces are smooth and virtually featureless, with only small hairline cracks to follow. 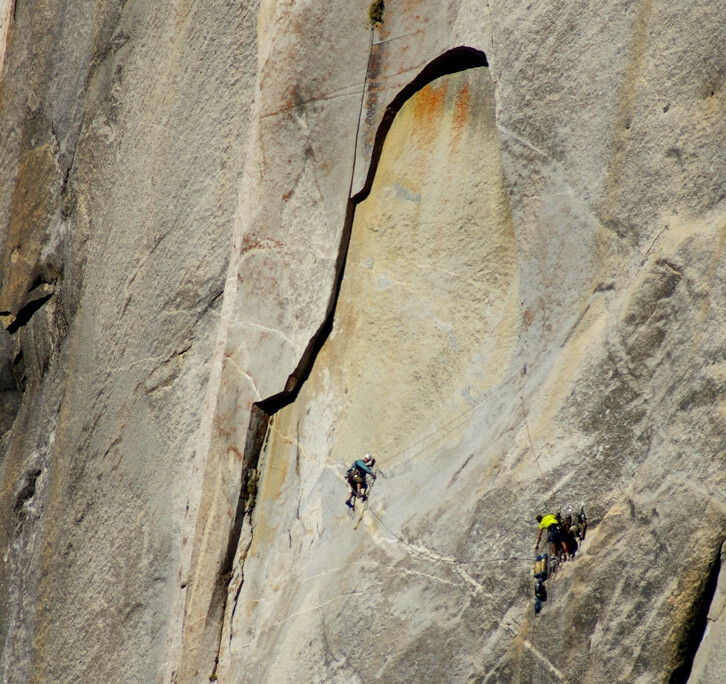 It's not possible to climb much of Half Dome without aid; using thin pitons and spending hours upon hour hand-drilling bolt holes (bolts are only permitted in Yosemite if exclusively hand-drilled), which is why most people are drawn to El Cap where they can climb a big wall but still free climb. So the answer appears to be: There are more routes to climb on El Cap, and the quality of climbing is better/more varied. Not the answer you're looking for? Browse other questions tagged rock-climbing aid-climbing big-wall-climbing yosemite or ask your own question. Big Wall Climbing Portaledge Toilet Etiquette? What specs for binoculars to spot climbing routes?